Good new arrived through the online post last week in the form of the 17th Occasional Wideopen Magazine. Even if the guys at Wideopen got a bit sloppy with their timekeeping this year, the magazine they put out is always a pleasure to read. A mountain bikers' mountain bike mag. Highlights have got to be the Enduro Des Nations report (Must do that one day) and the feature on Les Gets locals. Even if you are not into DH, get it downloaded. The most excellent news of all was news that Matt and I's 8 attempts at getting a good autumnal drifty shot were not wasted, and ended up on the closing page of the magazine. Ok,ok, it is not the cover, but it is the first time a photo of mine has seen print 'just because', so pretty chuffed with that. Getting roosted by twigs and leaves over and over seems worth it now. Hopefully a few more shots will see the printed light of day this year. 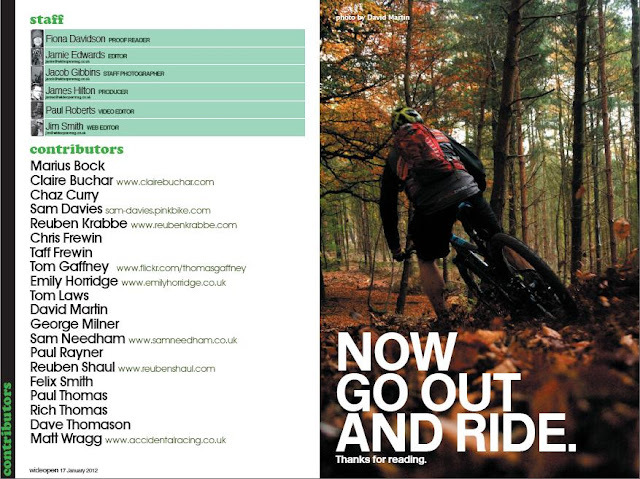 And while you are at it, why not check out Matt's excellent bike shop Twelve50 Bikes Tell them we sent you.